○Reasons why we recommend medical check before buying conctact lenses. In order to use contact lenses with correct data of your eye, you must receive medical check and prescription from an ophthalmologist. 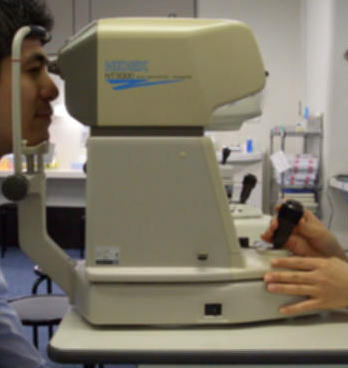 Since our eyesight changes time to time, you need a thorough inspections from a specialist. You cannot make a decision on your own. Nowadays, living environment is quite diversity so it is necessary to be deliberated carefully about your lens material, power, and shape. There are various brand for contact lenses. It is difficult to choose the suitable lenses from others’ evaluation and reviews. We recommend you to receive medical examination from an ophthalmologist and full explanation from the staff, and actually try wearing them before buying. There are several diseases that medically prohibit using contact lenses. For example, acute inflammation of anterior eye part, infectious eye disease, uveitis and heavy dry eye are some of the diseases. These diseases can only be diagnosed by ophthalmologists. Among these diseases, some of them can be easily noticed by subjective symptoms, but some can be difficult to see under lifestyle habits and other diseases. Also, most people leave some diseases untreated. Using contact lenses under those conditions can make the disease worse, and might completely lose your eyesight. 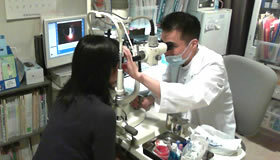 By having medical check-up by an ophthalmologist, you can prevent the worst situation. There are lots of people who feel dryness or eyestrain while using contact lens. It is important to judge if wearing contact lens is available for you or not. In addition, doctor will give you information; important point when you wear contact lens, which lens to choose. In the case when the lens you bought didn’t fit, there might occur eyestrain or headache if you use them with too much enduring. Depending on the lens, it can cause keratitis or conjunctivitis so it is necessary to consult doctor before buy lens. We recommend you to buy lens at shop whose guarantee is substantial. There is a contact lens shop “J contact” at the same floor of our clinic. Returning and exchanging is available for all contact lens and they also have full of guarantees. Hand it to the reception when you are finished. By bringing the wirtten questionnaire from your home, it reduces your waiting time. You can download our English medical questionnaire from below. Click the URL, download the PDF file and print it out at your home. Please tell the reception if you have the written questionnaire with you when you visit our clinic. First, fill out the questionnaire. Then, come inside the examination room when your name is called by the staff. 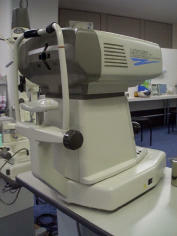 Auto ref keratometer: measure degree of myopic, hyperopia or astigmatism. You will have your view ability checked, based on the results of the kerato meter. Choose contact lenses with the staff. Wear the contact lens chosen, check your view ability again and adjust the power. Having consultation with an ophthalmologist is necessary not only to see if the lenses fit you, but also to see the condition of your eye. 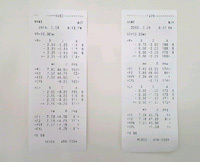 Prescription will be made by our staff after explaining the precautions and way to clean your lenses. Bring your prescription to the shop next to our clinic to buy your contact lenses.